The Clubman hits all the right road trip notes. While not large by anyone’s standards, the car manages to seat four grown adults comfortably. 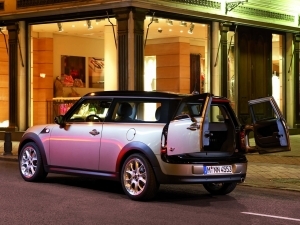 The passenger club door makes piling into the rear seats less of a challenge and the barn-style rear doors make room for plenty of gear in the back. S trim delivers the same driving fun as the Clubman’s even more diminutive brothers, making your time behind the wheel as fun as you thought it would be. Engine and Drivetrain: Turbocharged 1.6-liter inline four-cylinder engine, 172 horsepower, 177 lb-ft of torque; 6-speed manual, 6-speed automatic transmission; front-wheel drive. One part Jetta, one part BMW X3, the Tiguan manages to eloquently combine what’s to love about both. Powered by an inline four, this little rover gets respectable mileage while carrying cargo and friends down the road in style. Of course, this little V-dub’s low price tag means you can put your money to more important things—like fuel. Engine and Drivetrain: 2.0-liter inline four-cylinder engine, 200 horsepower, 206 lb-ft of torque; 6-speed automatic transmission; front wheel drive. The V50 is the wagon we would have built. With a Dynaudio stereo system that offers some of the best sound in any vehicle and a unique free-floating center console, this Volvo’s interior is a pleasure on every level. The joys don’t stop there, as the V50 is available with a powerful turbocharged five-cylinder and all-wheel drive. Plenty of space, plus plenty of power, equals one great road trip rig. Engine and Drivetrain: Naturally aspirated 2.4-liter inline five-cylinder engine, 168 horsepower, 170 lb-ft of torque; turbocharged 2.5-liter inline five-cylinder engine, 227 horsepower, 236 lb-ft of torque; 5-speed automatic transmission; front-wheel drive with optional full-time all-wheel drive. Sure the A3 Sportback looks a little more wagon than some of the contenders out there, but the similarities to the grocery haulers of yore end there. This car is a rocket when equipped with the 250 horsepower 3.2-liter V-6 and full-time all-wheel drive. Even in four-cylinder trim, the Sportback manages to provide a fun driving experience for you and your friends as you tackle the open road. Engine and Drivetrain: 2.0-liter inline four-cylinder engine, 200 horsepower, 207 lb-ft of torque, 3.2-liter V-6 engine, 250 horsepower, 236 lb-ft of torque; 6-speed manual, 6-speed automatic transmission; front-wheel drive with optional full-time all-wheel drive. The people’s luxury sports sedan, the TSX, combines surprising amounts of comfort and driving fun. Part of its lethal road trip one-two combo, Acura’s rambunctious four-door can brag about a smooth 201 horsepower V-6 engine. Coupled to a close-ratio 6-speed manual transmission, the TSX is almost as much fun as you can have in four doors. The optional automatic 5-speed doesn’t dull the driving experience either, and the tech-laced interior is anything but boring. Engine and Drivetrain: 2.4-liter V-6 engine, 201 horsepower, 172 lb-ft of torque (manual transmission), 170 lb-ft of torque (automatic transmission); 6-speed manual, 5-speed automatic transmission; front wheel drive. Sporting the stylish looks of the larger CX-9, Mazda’s five-seater can tote an array of gear thanks to its 60/40 folding rear seat. The hauling options let you maximize the sidekick to snowboard ratio, and the swank interior gets everything there in style. The CX-7’s powerful turbocharged four-cylinder provides the kind of oomph you’d expect out of a sports car, too. Engine and Drivetrain: 2.3-liter turbocharged inline four-cylinder engine, 244 horsepower, 258 lb-ft of torque; 6-speed automatic transmission; front-wheel drive with optional full-time all-wheel drive. Made for a trip to the beach, the Edge comes with cool options to make the ride there more fun. DVD navigation, SIRIUS satellite radio and Ford’s SYNC technology are options that are sure to keep you entertained. The vista sunroof lets the sun in when you want it and keeps cabin noise to a minimum when you don’t, giving you the drop-top feel without an embarrassing sunburn. Engine and Drivetrain: 3.5-liter V-6 engine, 265 horsepower, 250 lb-ft of torque; 6-speed automatic transmission; front-wheel drive with optional full-time all-wheel drive. The Element’s near water-proof interior repels fast-food assaults flawlessly, and the surprising amount of cargo room inside means that you can take whatever you want, wherever you want to go. Available in all-wheel drive for when the going gets tough, or in a more stylish SC model, this rig has your road-trip needs covered. Engine and Drivetrain: 2.4-liter inline four-cylinder engine, 166 horsepower, 161 lb-ft of torque; 5-speed manual, 5-speed automatic transmission; front-wheel drive, optional all-wheel drive. In base trim, the XB comes loaded with everything you need to hit the road and keep going. Cruise control, an excellent Pioneer sound system with an iPod connector and plenty of cup holders all allow roll on until the break of dawn. This Scion’s super low base price and great fuel economy are added bonuses. Engine and Drivetrain: 2.4-liter inline four-cylinder engine, 158 horsepower, 162 lb-ft of torque; 5-speed manual, 4-speed automatic transmission; front-wheel drive. The baby crossover of the Nissan clan, the Rogue’s somewhat demure styling shrouds a trip-worthy machine. Armed with Nissan’s intuitive all-wheel drive, the Rogue senses when all four wheels need power and adjusts accordingly. When the going gets easy, the drive line sends power to the front wheels only, saving fuel and letting you spend your money on the next cheeseburger instead of the next fill-up. MSRP: 2.5-liter inline four-cylinder engine, 170 horsepower, 175 lb-ft of torque; continuously variable transmission; full-time all-wheel drive.